We will eat our share of true empanadas soon and I'll come back home to share various new dough techniques on this food blog. but in the meantime these simple fat and happy versions should not be missed! Fat and Happy Food Blog Tips and Techniques: Leeks are a dirty vegetable, the layers act as a complete dirt magnet. To clean, trim off the green ends and the white base. Remove any ragged outer layers. Cut the leek in halve lengthwise and rinse well under running water, working water through each layer. You can also chop the leek in pieces and soak in a bowl of cold water allowing the sand to fall to the bottom of the bowl. 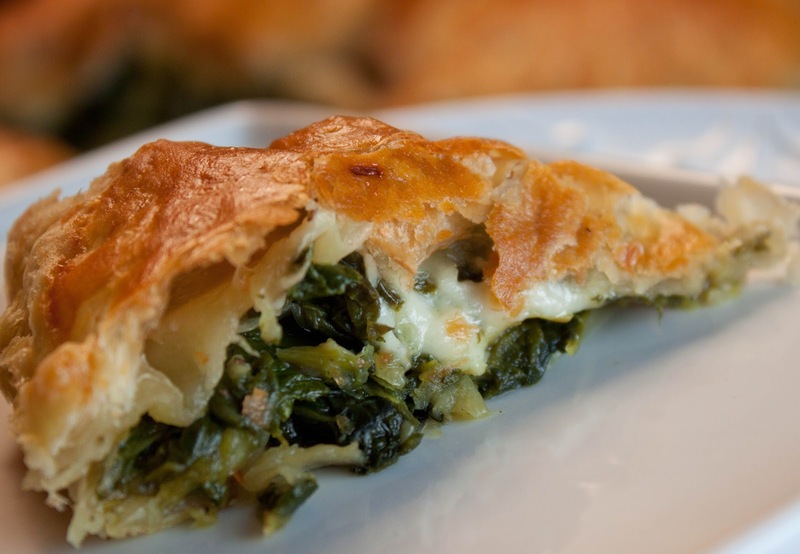 Remove the phyllo dough from the freezer, follow package instructions to thaw. Preheat oven to 375 degrees. While the dough is defrosting make the spinach filling. Warm the olive oil over medium heat in a large saute pan and add in the leeks. Cook about 5 minutes or until the leeks begin to soften, tossing often. Add in the garlic, turmeric, red pepper flakes and spinach. Cook until spinach is cooked down and has reduced; this will take about 5 minutes. Set aside to cool. Slightly roll out the phyllo dough so it's not too thick. Cut large circles in the dough, you should get about 4 circles of dough out of each phyllo sheet. 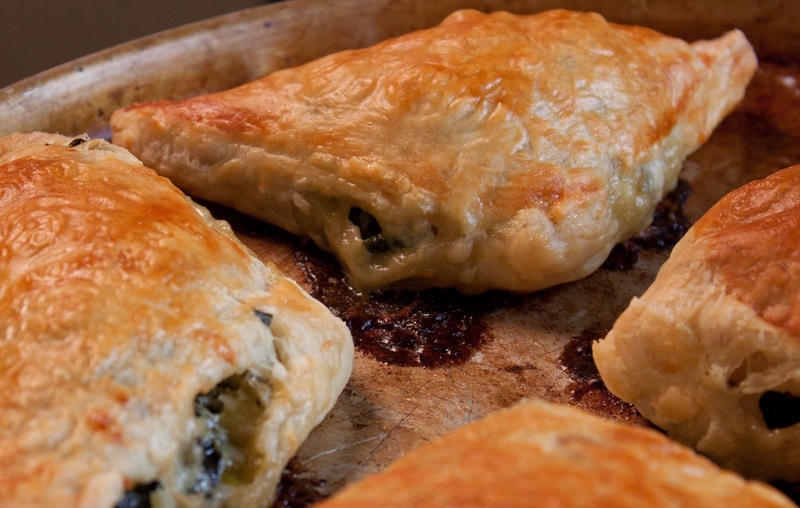 Place a heaping scoop of cooled spinach filling on one side of each dough circle. Top the spinach with desired amout of shredded cheese. Close the pie by pulling half of the circle over the top of the filling so the edges meet, creating a half moon shape. Pinch the edges together, if the dough has become dry you may need to rub the edges with a little water to get them to stick. Whisk together one egg and 1 tsp of water. Brush the top of the pies with the egg mixture; this will help give them a golden brown color. Place the spinach pies on cookie sheet lined with parchment paper. Bake until the dough is puffy and golden brown, around 20 minutes. Enjoy warm or at room temperature.